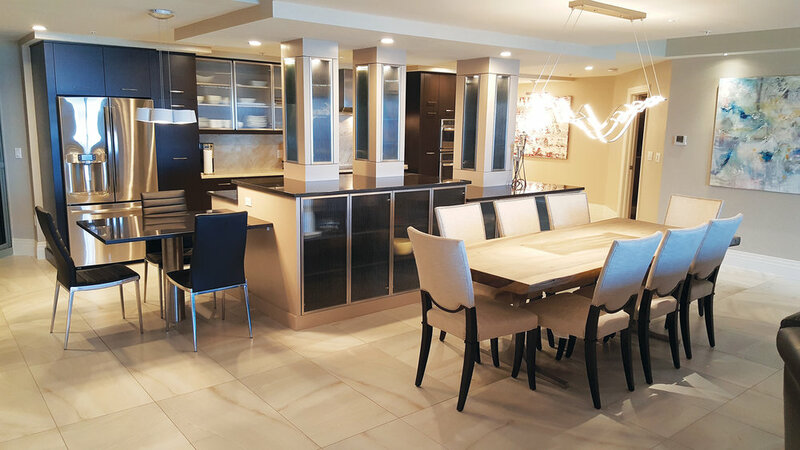 When the owners of this Naples condo approached our owner, Garth Wurstle about their remodeling project, they had three things they wanted to accomplish. First, they wanted to dramatically update the look of their kitchen and other cabinetry as part of a complete remodeling project managed by Zynda Custom Homes and Remodeling. Second, they wanted their custom cabinetry to merge two different styles—contemporary and transitional. Third, they needed a kitchen that provided extensive storage to give them a place for important and memorable items they had collected during their marriage and for entertaining family and friends. Changing the layout of the kitchen to improve functionality was step one. Providing counter space for preparation is essential we balanced their new kitchen layout by placing the refrigerator and dual ovens on opposite ends of the kitchen with the counter in between. The addition of stainless steel rollout pantries allows the clients to easily access, cook and use the kitchen on a daily basis without having to clutter up the counter with spices and kitchen equipment. Dual trash cans were also important for recycling or overflow for large gatherings when needed. A common problem in high rise condominiums is fixed plumbing that runs between floors and units. On the island we created an attractive casing by covering them in backlit ribbed glass that matched the cabinets on the back wall and the touch latch glass doors on the front the island. The plumbing is now a beautiful feature in the kitchen and showcases how a problem can be turned into a positive. A bistro table extension was added to the end of the island for light dining when needed. Unlike many kitchens we see today, the owners knew they did not want another white kitchen so we stained their sleek, flat front cabinets a rich glossy brown and finished them with stainless steel pulls. The taupe island adds contrast utilizing glass, stainless steel frames and matte finishes creating a truly unique centerpiece for the great room. The counters are two different tones of quartz and provide the look and feel of natural stone with sparkles and veining. Quartz is a great option for kitchens as it is low maintenance when compared to granite or marble. Throughout this project, the collaboration and communication between the remodeler, the clients and our design team was exceptional. Working together we created a one-of-a-kind kitchen that is beautiful and functional and one that the owners can enjoy for years to come. Encore Cabinets & Design can meet all your design and cabinetry needs. Let our imagination run free with the design of your retreat. Anything is possible with our endless array of cabinet choices and selections. We are a full service award-winning cabinet and design firm serving Naples, Marco Island, Bonita Springs, Estero and Fort Myers, along with the finest communities throughout Southwest Florida.